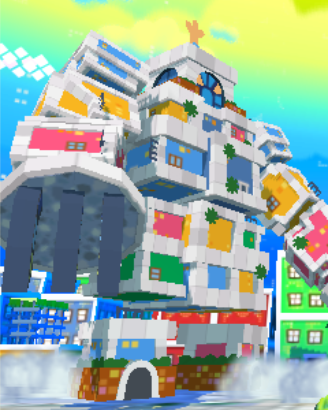 Earthwake is a giant robot fought by Giant Dreamy Luigi in Mario & Luigi: Dream Team that serves to guard the Nightmare Chunk holding Bedsmith. Earthwake is a humanoid robot figure formed out of Dreamy Wakeport's various buildings, with its head being a small tower with glowing windows for eyes. Earthwake is the second major boss fought in Dreamy Wakeport, as well as the third giant Dreamy Luigi boss in the game. Earthwake's name comes from the word earthquake, and possibly the word "awake", fitting the sleep and dream-related naming scheme of the game. This is further suggested by its declaring "EARTH-AWAKE" late in the battle. It also bears characteristics of a poltergeist in that the buildings are not really a part of it, but merely possessed to be used as a makeshift body, as soon as a building comprising its body is destroyed, a new one moves into its place, with the only part that takes damage being the head. While exploring Dreamy Wakeport to revive Bedsmith, Mario and Luigi come across the Nightmare Chunk trapping him inside a tower-like building. Shortly after, Pi'illoper shows up and warns them of a "terrible guardian" who attacks anyone who tries to remove the Nightmare Chunk, and has destroyed many who have attempted to do so. Mario and Luigi hit the ! blocks that Pi'illoper told them awakened the guardian, causing the small tower next to them to reveal itself as Earthwake's head. Detecting intruders, Earthwake assembled its body from the buildings around Dreamy Wakeport and began pursuing the Mario Bros. In response, Starlow enabled Dreamy Luigi to attain his giant form, which engaged Earthwake in battle. After the battle, Earthwake is destroyed and Bedsmith is freed. As such, it doesn't appear for the remainder of the main adventure. The battle against Earthwake is based around a similar mechanic to the Tower of Yikk battle from Mario & Luigi: Bowser's Inside Story, in that both combatants must try to knock each other into the water surrounding Dreamy Wakeport. In Luigi's case, this is best done by countering Earthwake's attacks and using the Hammer Uppercut on his own turns. Performing the Jump and Drill Stomp attacks while Earthwake lacks head armor will harm Luigi, due to the electrified object on Earthwake's head, while attacking with the Hammer Chop will deal minimal damage. If Earthwake gets knocked into the ocean, Luigi must use his hammer to repeatedly smash the boss as it tries to rise out of the water. The player must rapidly slide the stylus downwards on the Touch Screen to strike Earthwake. As Luigi lands more hits on Earthwake, the ratings gotten from each hit will eventually escalate in value, going from OK! ratings to Good! ratings to Great! ratings. If Luigi hits Earthwake enough, it will sink back into the water, before rising up again in a daze. Luigi must then smash Earthwake into the background with a Hammer Chop to deal even more damage and get an Excellent! rating. No matter how well Luigi does during this sequence, Earthwake will eventually return to the center of the city and reform its body to continue the battle. If Luigi gets knocked back into the ocean, Earthwake will put its hands above Luigi, and repetitively smash down on Luigi's skull with a metal plate until he escapes or is defeated. Jumping while Earthwake's hands are above Luigi will result in him bumping his head on them and the plate, making him land back into the water. Luigi must jump when Earthwake's hands are not above Luigi in order to escape the attack and resume the battle. One of Earthwake's attacks separates its body into its component buildings, which begin to orbit its head. Luigi has to swat the pieces away with his hammer (by sliding leftwards on the Touch Screen as the buildings come into range); if he fails to knock away all of the pieces in time, the remaining buildings will fly into him, damaging him and knocking him back. If Luigi successfully knocks away all of the buildings, the enraged Earthwake's head will begin orbiting in the same path as its buildings, but slightly faster. Failing to hit the head after a few rotations will lead to it ramming Luigi much like its buildings; on the other hand, success will damage Earthwake slightly and force it back. Earthwake can also attack by creating a ball made out of Dreamy Wakeport's buildings, and then rolling it towards Luigi. Luigi must jump on top of the ball when it nears him and use it to roll into Earthwake in order to counter-attack. The player tilts the 3DS to control the ball's backwards and forwards movement. In some cases, Earthwake may attempt to swing its arms forwards in order to knock Luigi off the ball and damage him but this has a very low success rate as Luigi almost always rams him hard enough to knock him into the ocean. Earthwake will also set up a formation of yellow, red and green blocks that it will use to attack Luigi or heal itself the following turn. Luigi must Hammer Chop, Hammer Uppercut, Jump or Drill Stomp to prevent the most hindering blocks from being used by Earthwake. The Jump and Hammer Uppercut will eradicate a vertical line of five blocks, the Hammer Chop will do the same for a horizontal line of five blocks, and the Drill Stomp will eradicate all the blocks on screen, leaving none left and being the best move for Luigi to perform in this situation. On the turn after the above move, Earthwake will collect any remaining blocks and use them to attack Luigi and heal itself. The yellow blocks heal Earthwake so it is recommended to destroy all yellow blocks. The green and red blocks will be thrown at Luigi, with the green blocks coming low and the red blocks going high. To jump over the green blocks, the player must slide upwards on the Touch Screen. Getting hit by a red block will result in Mario getting knocked off and rendering the Drill Stomp and Rhythm Mushroom moves unavailable. To duck under the red blocks, the player must slide downwards on the Touch Screen. Each time it is knocked into the ocean, Earthwake afterwards generates heavy grey armor that will reduce the knockback it suffers from Luigi's attacks. If the armor is only on its head, the Jump and Drill Stomp attacks can destroy it in a single turn. If the armor covers its head and body, only the Drill Stomp attack will remove it in a single turn. If Mario is not ready to perform Bros. Attacks, Luigi can also execute a combination of the Hammer Chop and Jump attacks to remove the armor in two turns if used one after the other. If Earthwake attacks while it still has armor on, the armor will be temporarily taken off and put back on after the attack. Earthwake also has the ability to transform into a giant hammer and swing itself at Luigi in either an overhead high arc or a horizontal waist-level arc up to seven times. Luigi must counter the overhead swings with Hammer Uppercuts and countering or evading its horizontal swings with either Hammer Chops or by ducking under them. The player must slide upwards on the Touch Screen to Hammer Uppercut, leftwards to Hammer Chop and downwards to duck. The final swing will always be an overhead one that has a much longer pause before Earthwake swings itself at Luigi. Failing to block this attack will inflict heavy damage on Luigi and send him skidding backwards a great distance; success, on the other hand, sends Earthwake flying back substantially. There is a sound when Earthwake is going to hit Luigi and in a split second, it will hit Luigi. This is infamously known as its toughest to dodge attack because of the precise timing required to counter. In the Hard Mode, Earthwake's attack patterns differ slightly. It attacks Luigi in its hammer formation more often, sooner and swings in this form up to ten times per attack. Earthwake also uses larger block formations (that have eleven blocks in it instead of nine) which often forces Luigi to leave more blocks left. WARNING. UNAUTHORISED. EXIT NOW. !OR ELSE! SYNCHRO OPTIMISED... BOOT TRANS-MODE 1... EARTHWAKE SYNCHED! ERADICATOR ONLINE! BAD-DAMAGE! DAMAGE-BAD! BAD-STACHES! MUST DEFEAT! It is the only Giant boss in Mario & Luigi: Dream Team that isn't fought on Dreambert's pillow, thus making it the only giant battle where Dreambert is in his full body. Mezame Fōmu Awakening Form. Probably a nod to Transformers. Spanish (NOA) Terretrón From Tierra (earth) and tron. Spanish (NOE) Robot Despertares From robot, despertar (wake up) and Ares (Greek god of war); Despertares can alternatively mean awakenings. French (NOA) Protodor From protector and dort (sleeps). French (NOE) Morphinger From morph. Portuguese Despertarrobô From despertar (wake up) and robô (robot). Ireonapomeo From "이러나 타운" (Wakeport) and Transformers. This page was last edited on March 15, 2019, at 20:06.